I’ve been neglecting this here blog long enough. It’s time to get back to it. I never made baby books for the girls, this was supposed to be it. You’d think nothing’s been happening in our lives with the cobwebs growing around here in this virtual little world. 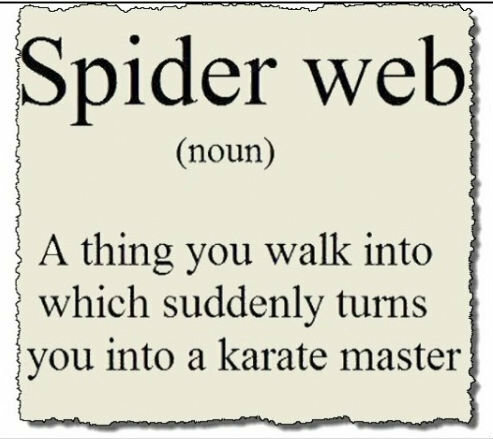 Speaking of cobwebs, boy howdy yesterday a spider attacked me, and yes, I think I really did pull something trying to karate chop it. Don’t laugh too hard, you know that you too become a ninja when you walk through a spider web. This was so much worse than merely walking through a web. Since she wasn’t in there doing what she had been told numerous times to go do, I went in to wash my face. I walked in, flipped the light on and got about halfway to the sink when I noticed something black hanging down from my bangs. At first I just sort of flipped my hair thinking it was fuzz or something harmless. Then it dawned on me that it was not vacating my hair. Rather it had legs that were flailing trying to reattach themselves to something, anything at that moment. I let out an odd sounding, “WHAAAAAAA” noise and start jumping around like I had actual fire ants in my pants. My arms were flapping, my hair was flying, my feet were jumping (you’ve been there, don’t judge me!) Finally I manage to make contact with the black, hairy beast. Sensing I was in distress, the Little One came racing in to the bathroom, spotted the squashed spider on the floor and let out a blood curdling scream. At which point, the Husband finally gets off the couch to see what the commotion is all about. Instead of being concerned for me and the near heart attack I just about had, he shares his own distress about being so afraid that someone lie dying in the bathroom because of all the noise. Best I can tell, this poor, now dead, spider had created a web and was lowering itself down from the fan vent in the ceiling. I will say that it is very unusual to find a spider dangling in the middle of my house. Find one in the corner in a nice cozy cobweb, well that’s a lot more common. I’m going to do my best to keep the cobwebs out of this little space and share some more about our daily adventures and antics. Hope you will stick around, there aren’t too many dull moments around here. ← It’s Almost Cookie Time!